Petroleum exports account for approximately 50% of Ecuador's income. There are approximately 3.3 million internet users in Ecuador, and 2.5 million televisions. Many of the people living in Columbia, to Ecuador's north, move to Ecuador to escape the violence surrounding the drug trade in Columbia. Approximately 72% of Ecuadorians are mestizos, 15% are indigenous, 6% are white, and 7% are Afro-Ecuadorian. Ecuador is made up of 24 provinces. There are 25,000 plant species, 1,600 bird species, 6,000 butterfly species, and 138 widespread amphibian species in Ecuador. The 26th highest active volcano in the world is the Cotapaxi Volcano in Ecuador. It is 19,357 feet high. Natural resources in Ecuador include petroleum, hydropower, timber, and fish. Soccer is one of the Ecuadorian's favorite pastimes. Ecuador's national card game is Cuarenta. Ecuadorians celebrate a holiday called 'The Day of the Dead'. Ecuador's agriculture includes bananas, coffee, cocoa, rice, potatoes, tapioca, plantains, sugarcane, and livestock such as pigs, sheep, cattle, as well as fish and shrimp. The most populated cities in Ecuador include Guayaquil, Quito, Cuenca, Santo Domingo, Machala, Manta, Portoviejo, Ambato, Riobamba, and Quevedo. The guinea pig is a delicacy in Ecuador. It supposedly tastes like rabbit. The smallest country in the Andean Highlands is Ecuador. In 2008, Ecuador became the first country to declare that nature itself has constitutional rights. The four geographical regions of Ecuador include the coastal lowlands, the mountain highlands, the eastern jungle lowlands, and the Galapagos Islands. Ecuador is one of the world's biggest banana exporters. Charles Darwin began studying evolution in the Galapagos Islands because it was there that he noticed the diversity of species. The Galapagos Islands are home to some of the most varied species, including giant turtles and giant land iguanas. 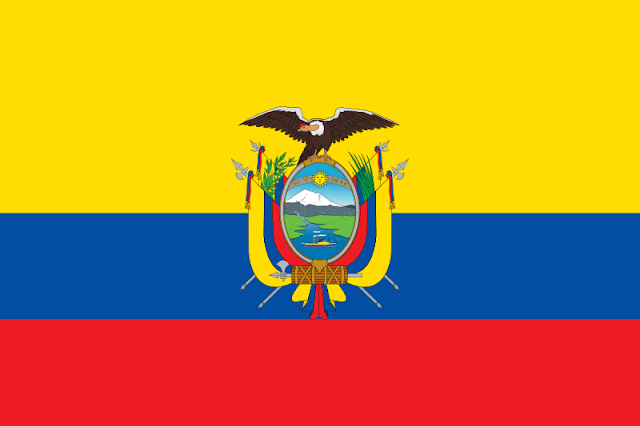 Ecuador celebrates Independence Day on August 10th each year. Visitors to the Galapagos Islands are not permitted to bring anything that may alter the ecosystem. Spanish is the official language. Some residents of Ecuador also speak Quechua and other Amerindian native languages. The world's rarest creature is the giant tortoise. A giant tortoise named Lonesome George was a national emblem for Ecuador. When it died in 2012 there was a national day of mourning. The monetary unit in Ecuador is the U.S. dollar. Ecuador's capital city is Quito and its largest city is Guayaquil. The population of Ecuador in 2012 was 15,223,680. Ecuador covers an area of 106,888 square miles of land. Ecuador is the Spanish word for equator. The equator runs right through Ecuador.